Wandora is a desktop application to collect, store, manipulate and publish information, especially associative data and data about WWW resources. Wandora's data model is multilayered and based on Topic Maps. Addition to topic map formats, Wandora imports RDF and OBO (Open Biomedical Ontologies) files. Moreover, Wandora can extract topic maps out of various file formats and web services. Wandora contains over 50 different information extractors. These extractors include the Umbel concept search, The Guardian API extractor, Alchemy entity extractor, Bibtex extractor, Twitter extractor and SPARQL extractor. Wandora exports stored information in RDF, GraphML, DOT and many other data formats. 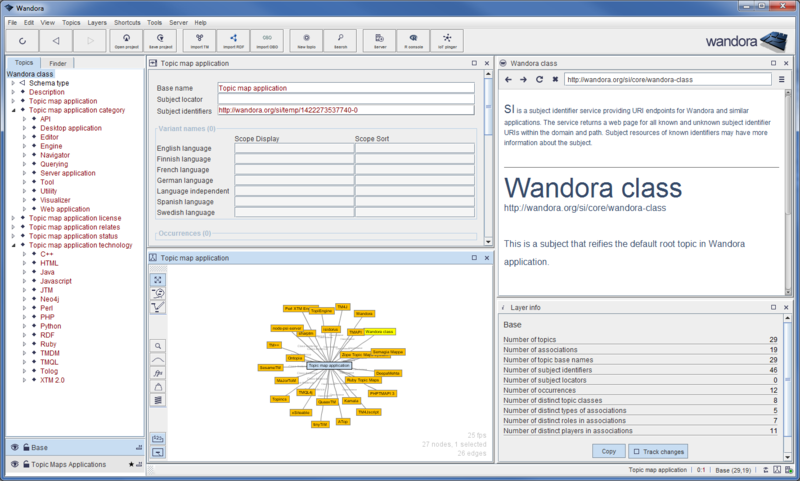 Wandora has several information visualizations including a graph and a treemap. Wandora includes a HTTP server providing simple HTML visualizations and data APIs for the application and stored information. 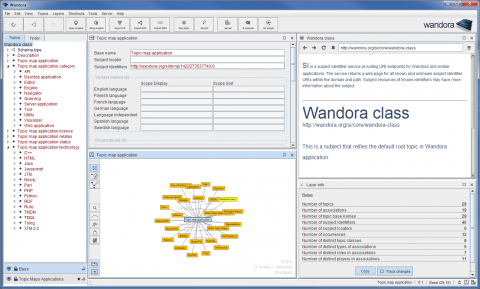 Wandora suits well for constructing and maintaining taxonomies, ontologies, semantic networks and information mashups. Application areas include linked data, open data, data integration, business intelligence, data mining, information extraction, digital preservation, data journalism, artificial intelligence and knowledge representation. Wandora is written in Java. Wandora is an open source and free application with the GNU GPL license. New Wandora release is out! New Wandora release is out now (2017-10-12). Wandora can save a project to a directory leaving all separate project files visible. This feature enables the user to edit project files with third party tools and applications. New Wandora release supports a small subset of GIT commands and the user can now clone Wandora projects out of GIT repositories, and push changes back to GIT repository. If the supported GIT commands are not enough, the user can always use her favourite GIT tool to access and manipulate the project repository. New Wandora release has some feature enhancements and bug fixes also.